The following article appeared in Left Business Observer #106, January 2004. It retains its copyright and may not be reprinted or redistributed in any form - print, electronic, facsimile, anything - without the permission of LBO. This is an edited version of a talk given by LBO editor Doug Henwood at various places around the U.S. and in London in late 2003 and early 2004. It's drawn mainly from his new book, After the New Economy, published by the New Press, a book whose sales this text is intended to promote. I started working on After the New Economy when the thing was alive and kicking - back when the Nasdaq was around 3,000, heading towards 5,000, and the air was thick with irrational exuberance. I finished the first draft at the end of February, with the Nasdaq at 1,340, 75% off its high. And now it's appearing with the Nasdaq over 2,000 - up 50% from the low. I must learn to write faster. Remember the New Economy? It was one of the wonders of the world. Computers had unleashed a productivity miracle, recessions were relics of a transcended past, ideas had replaced things as the motors of economic life, the world had become unprecedentedly globalized, work had become deeply meaningful, and mutual funds had put an end to class conflict. Even to conventional minds, a lot of that sounds embarrassing now. But commentary on the era usually treats it as a mix of collective folly and outright criminality - never as something emerging from the innards of the American economic machinery itself, from our unregulated labor markets, our hypertrophied financial sector, and our national penchant for unreflective optimism. And now we're forgetting about it, our amnesia encouraged by the frequent reminders that we're in a state of permanent war. I could fact-check a lot of the claims, and I have. GDP growth in the 1990s was good, but well below 19th century rates, and little different from the growth rates clocked in the much-maligned 1970s. But it's still taken as a time of almost unprecedented prosperity. Productivity growth looks strong, but there are plenty of technical oddities behind the reported numbers that I explore in the book. Regardless of the technicalities, how much better off do we all feel for that alleged productivity revolution? More exhausted and more insecure, I'd guess. I could spin out stats on how income and wealth distribution are the most unequal than they've been since the early 1930s. Half the population, even at the peak, didn't own a share of stock, and among those who did, average portfolios were tiny. Wealth remained massively concentrated at the top. Globalization is hardly a new thing, even if you can define it, which a lot of people, even experts, can't. Techno-utopianism is an old theme in American culture. Bill Gates's fantasies of the frictionless economy - spun out in a book by that title with, it's said, the assistance of thirteen ghostwriters - were the latest incarnation of an old elite desire to put workers and the ugly things that sometimes come with them out of sight. We've been hearing about postindustrial society for at least thirty years; if it had come about, would we have to worry about global warming? And the whole phenomenon of New Eras itself is hardly new either. We had a New Era at the turn of the last century, another in the late 1920s, and yet another in the late 1960s, all spun out with similar imagery and all periods that were followed by years of structural economic stress. 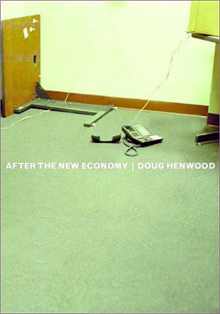 Though the book is organized around the New Economy moment and its aftermath, the real story is what's been happening to the economy since the onset of an intensified capitalism - what many people outside the U.S. call the era of neoliberalism - whose birth is associated with the names Reagan and Thatcher. Let's look at the world of work, which is where the late 1990s productivity revolution was happening. If we are in the early stages of a technorevolution, we're certainly not distributing its dividends in the form of a lighter workload: Americans have to work awfully hard to make ends meet. While average incomes have risen considerably over the last half-century - rapidly for the first twenty-five years after World War II, far more slowly thereafter - the amount of work necessary to earn those incomes has risen with equal relentlessness. A worker paid the average manufacturing wage would have had to work sixty-two weeks to earn the median family's income in 1947. In 1973, it would have taken seventy-four weeks; in 2001, eighty-one weeks. So, despite the fact that productivity overall is up more than threefold over the last fifty years, the average worker would have to toil six months longer to make the average family income than he or she did half a century earlier. And the increase in the work effort came at a more punishing pace in the 1990s than it did in earlier decades. Of course, it's not just individual workers who are putting in longer hours; an ever-larger share of the adult population has entered the paid workforce - mainly women, who aren't getting much relief in their household labors to compensate for their increased presence in factories and offices. International comparisons confirm the picture of the U.S. as a workhouse economy. American workers put in more hours per year than do workers in Western Europe; only workers in East Asia spend more time on the job than do Americans. And our workers don't produce as impressively as people seem to think. Workers in the Netherlands, Germany, France, and Italy all produce more in an hour than do their American counterparts; Americans come in barely ahead of workers in Ireland and Sweden. Nor has the growth in U.S. productivity over the recent past been all that impressive; in a 1999 IMF study of nineteen major countries, the U.S. came in dead last in productivity growth between 1973 and 1996. It's only over the latter part of the 1990s that U.S. productivity performance ran ahead of that of its peers - though not all that far ahead, if you use comparable statistics, as more recent work for Credit Suisse First Boston by Julian Callow shows. Why does productivity matter? Over the long term, rising productivity is what makes possible rising living standards. Possible, not inevitable; productivity gains in money form have to be divided between profits and wages. And for most Americans, the late 1990s were pretty good times, but hardly miraculous. Incomes rose modestly, but not spectacularly. And although productivity has continued to rise, according to the official stats, in the recent recession and so-called recovery, it certainly doesn't feel too good to most of us. Wage gains have disappeared. The latest chapter in the productivity miracle is more about overwork and speedup than any technological wonder. We're back where we were 100 words ago - in the workhouse economy. Or, to quote New York Times reporter Alan Cowell, the American way of economic life is all about "working longer for less." That's a great approach if you're on the top of the heap. As I said earlier, for most of the 1990s, the distribution of income got more unequal. Late in the decade, real wages rose and poverty rates fell, but in retrospect these good things now look like the happy byproducts of what turned out to be an unsustainable bubble. For the past 20-25 years, the major winners in the U.S. have been the very rich, the top 1-2% of the population, those with incomes of $1 million or more. The upper-middle class - people with incomes in the low six figures, say - did pretty well, but nowhere near as well as those above them. And people in the middle and below have mostly done rather badly, though there was a brief, temporary democratization of the good times in the last years of the last decade. Which brings me to another issue, the most memorable feature of the period, the great bull market in stocks. When warming to the topic, it's often tempting to denounce the whole Wall Street racket as parasitical, which it can be, and utterly pointless, which it isn't. Financial claims involve relations of ownership and power and appropriation of other people's money. Dividends on stock are disbursements from profits, which originate in the uncompensated labor of the firm's workers. Interest on corporate bonds comes from the same source, and on government bonds from taxpayers. But financial power is about more than monetary transfer; financial claims confer real authority on their owners. Stockholders have demanded steadily higher profits, which kept corporations downsizing and outsourcing even in the best of times. Bondholders have pressured state and local governments to trim their budgets. Bankers and bondholders (in alliance with state institutions like the IMF) have forced severe economic restructurings on debtor countries. Driving the great bull market was the great upsurge in corporate profitability from 1982 through 1997, after a long erosion from its 1966 peak. That's what drove the stock-market rally, promoted the exuberant mood, and provided the cash to keep things going. It's not hard to figure out what caused the fifteen-year profit boom - a reversal of the forces that produced the sixteen-year bust that preceded it. The conventional story is that excessively stimulative and indulgent government policies led to a great inflation, compounded by the oil-price shocks of 1973 and 1979. There's some truth to the standard story, but it needs to be translated into political language. The long post-World War II boom had fed the expansion of the welfare state. The sting of unemployment was lessened, and workers became less docile. Wildcat strikes were spreading, and factory workers were smoking pot on breaks and sabotaging the line. Internationally, the U.S. had lost the Vietnam war and discovered that its conscript army was an undisciplined horde that was not shy about shooting commanding officers. The Third World was in broad rebellion, demanding global wealth redistribution and a new world economic order. Behind the economic concept of inflation was a fear among elites that they were losing control. That's not to deny the importance of accelerating prices. The inflation that peaked in 1980 didn't set any records, but its predecessors (in 1864, 1917, and 1947) were all during or just after major wars, when the economy is worked well beyond capacity to feed the military effort. The inflation upsurge that began in the late 1950s and accelerated in the 1960s and 1970s was unique in that it was not the by-product of a major war effort and that it looked more like a sustained increase than a temporary spike. It seemed that something structural had changed. Financially, that was experienced as miserable performance by the stock and bond markets. [U]nder a regime of permanent full employment, the "sack" would cease to play its role as a disciplinary measure. The social position of the boss would be undermined, and the self-assurance and class-consciousness of the working class would grow. Strikes for wage increases and improvements in conditions of work would create political tension. That would mean the loss of "discipline in the factories" and would put "political stability" at risk - which sounds a lot like the 1970s, from the factory floor to the global scene. It looked like a loss of discipline in the whole social factory. That indiscipline was met with the rightwing ascendancy of the late 1970s, a massively successful campaign of wage cutting, union busting, and public sector austerity on a global scale. It's ironic that the bull market became such a popular obsession in the late 1990s. The scores of millions of Americans who cheered as the Dow and the Nasdaq made their vertical ascent were really cheering a celebration of their own stagnant incomes and economic insecurity. It was a wonderful confidence trick, and a lot of people still haven't figured it out. I could go on in this vein, fact-checking and debunking. I'm not sure how much that matters. A lot of the New Economy mania was about fantasy, not fact, and fantasy is notoriously immune to factual refutation. But let's talk about that fantasy for a moment. It's tempting to read much of the New Economy discourse as largely ideological. The enthusiasts' claims often look a lot like preemptive defenses of capitalism against some of the classic indictments of it (not that there have been many of these in the air lately). Find capitalism too controlling? No, it's spontaneous! Too inegalitarian and exploitative? No, it overturns hierarchies! Vulgar, brutal, de-skilling, and mercenary? Au contraire, it's creative and fun! Unstable? Nah, that's just its miraculous dynamism at work! In fact, that was exactly the reaction of former Treasury Secretary Paul O'Neill, who, when asked to comment on the collapse of Enron, described it as "part of the genius of capitalism." All of which is, perversely, a way of saying that the New Economy discourse appealed to utopian impulses in these largely anti-utopian times. It would be nice if organizations could be made nonhierarchical, work be made spontaneous and fun, and everyone be cut into a share of ownership. That enthusiasts circulated those ideas and that others accepted them is testimony to their persistent appeal. But these things are unlikely to happen under actually existing capitalism. Insofar as the dot.com workplace was "fun," it's because the normal disciplines of capitalist profitmaking didn't prevail in the sector's early days. So instead, I'll conclude on a more optimistic note. While I'm obviously quite hostile to standard New Economy dogma, it's still worth examining its utopian bits. Arising in the midst of what looked like a period of unrestrained capitalist triumphalism, New Economy discourse expressed hopes for something rather different from our predominant economic reality. In a time of massive wealth polarization, it talked about the democratization of ownership. In a time of mass overwork, it dreamt of meaningful, enjoyable work, self-management, and flattened hierarchies. In what seemed like a profoundly conservative time, it appropriated language of revolution (the image of Lenin was even used to advertise a cable-TV company). Amidst a vast speedup of the social factory's assembly line, it evoked fantasies of abundance. And amidst aggressive attempts to privatize information, tighten up intellectual property restrictions, and put a meter on almost everything but the air, it stoked hopes for global linkages. "Information wants to be free," the saying goes, but not as long as Time Warner and the RIAA have their say. But why did The System's publicists need the utopian story? If all challenges to capitalism were dead, why did we hear so much about democratization and the overturning of hierarchy? Evidently the message has appeal, even in apparently conservative times. Fine. If a little hierarchy-overturning economic democratization is such a good thing, then why not more? As Jack Kemp once said in a very different context, if you're going to go for it, you should really go for it.